Etched signs are produced by acid-etching graphic images into metal plates. Etching is ideal for reproducing images with fine detail and small lettering. Graphics can either be raised or recessed, then filled with any color of your choice. Our custom-made signs are produced with machine and laser engravers. We have a large selection of plastics and metals we can engrave on, and many sizes and colors to choose from. Our engraved products are not limited to signs. 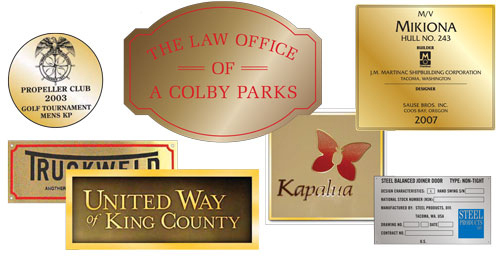 We also carry nameplates, name tags and assorted gift and award items. Call us at 253-383-5433 or e-mail us and we will be happy to answer any questions or provide you with a quote.